In calling for proposals to reimagine City Hall Plaza, the city could create a public-private partnership. On the table is exactly where City Hall Plaza has been for decades, as the hardworking staff has relentlessly chronicled. 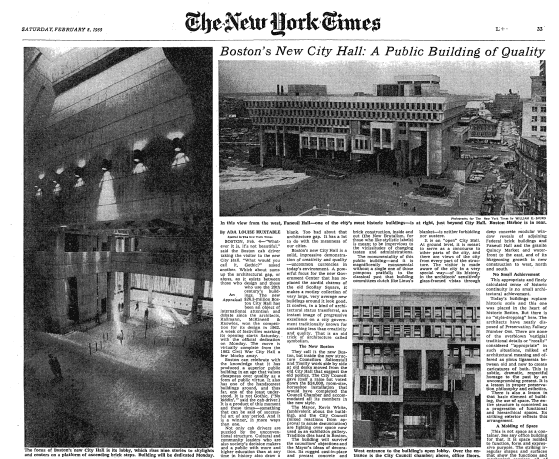 Ada Louise Huxtable, who loved the new Boston City Hall when it opened in 1969, is not yet turning over in her grave. And neither is City Hall Plaza. This entry was posted in Uncategorized and tagged Ada Louise Huxtable, Boston City Hall, Boston City Hall Plaza, Boston City Hall Plaza redesign, Boston Globe, City Hall Plaza, Daniel Koh, Marty Walsh, State of the City. Bookmark the permalink. Marty can dream, can’t he? Planting some good, old-fashioned ivy or other plants that drape might help. So would a well-sited wrecking ball. Any of the above would work for me, Mudge. Problem is, it’s been none of the (any) above for two decades.